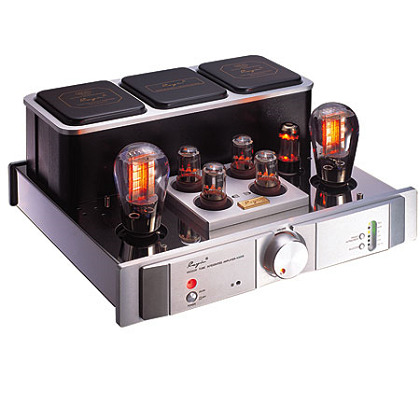 This improved model single ended class A integrated amplifier is equipped with a sophisticated rectifying stage using a pair of Russia made Sovtek 5AR4 (GZ34) rectifier tubes. The selected dome shape mesh plate 300B tubes discover the most delicate nuances of sound. The remote control operates all functions of the A-300B MK2: even the feedback level can be varied in two steps. On the top of the amplifier panel there is an elegant back lighted bias meter and it is very convenient to readjust the bias level of the power valves quickly without opening the cover. Hum balance adjustment can also be done in this simple way to achieve a dead silence background.